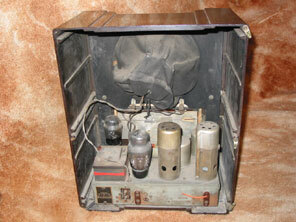 Shown here is the AC37 from 1936. Now we have a more conventional model name rather than the words that often titled earlier receivers. This set was also known as BC 3730L. The first thing to mention is that "L" on the end of the BC3730 model number. BC3730 could be considered to be the basic version of the receiver, designed for operation on 190 to 250 volts, hence suitable for anywhere in the U.K. The "L" was a special version suitable for use on 110 to 130, or 210 to 230 volts. This meant it could be used in countries with 110v mains, the U.S.A and Canada of course spring to mind. This ability to work on 110v mains cost the buyer an additional 6 shillings and sixpence, so it was not a feature to purchase unless really required. Looking at the receiver itself we can see that it is GEC's second attempt to produce a bakelite and chrome receiver, much like that seen emanating from the Ekco works. 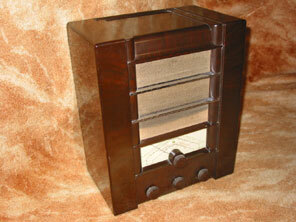 It cannot have been as successful as hoped, as it was the last receiver from GEC using the bakelite/chrome combination. (like many other manufacturers GEC continued applying chrome fittings to wooden cabinet receivers for a year or two longer). Two chrome bars protect the speaker cloth, and chromium plated feet have been fitted at the base of the two "columns" at either side of the receiver frontage. The chrome disc inserts in the control knobs of the AC Mains 4 from the year before are not fitted to this receiver. It does look reasonably impressive, but probably not as impressive as the Ekco "designer" models of 1936. (In particular the AC97 designed by Jesse Collins, costing £13.13.0 in black and white. Although the AC97 was further up the price range, the different approach to cabinet design is obvious). The receiver provides for long and medium wave, and the wavechange switch has a third position for bringing a "Droitwich Rejector" into the circuit on LW. The waveband selected can be viewed through a small window in the tuning scale, which this year has stations marked on it. The receiver is a TRF with a valve line-up of VMS4B, VMS4, N41, U12.